Lignin represents nearly one-third of plant tissues and is, after cellulose, the most important component of terrestrial plants. It is thus a key participant in the formation of organic material from carbon dioxide in the biosphere, and its reactions play a key role in chemical wood pulping and bleaching, and in other processes in which wood is subjected to chemical treatments. Knowledge of the nature and reactions of lignin is therefore not only of scientific but also of great technological, ecological and economic interest. More than a century of lignin research has produced an enormous amount of experimental results. However, as the findings are, to a large extent, not only unconnected to each other but also difficult to reproduce, lignin chemistry has remained in a state of obscurity. 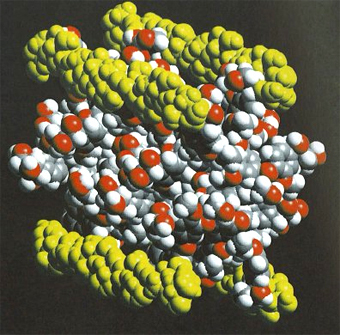 Thus in their acclaimed book Lehninger Principles of Biochemistry by David L. Nelson and Michael M. Cox (W.H. Freeman and Company, New York, 2005) the authors dismiss lignin with the sentence “The structure of the lignin polymer is complex and not well understood”. From the practical point of view alone, this is unfortunate as, for example, the chemical wood pulping industry, in its research and development work, lacks a working lignin chemistry, based on sound, reproducible experimental results. According to the prevailing hypothesis, lignin is one single polymer formed through oxidative polymerization of trans-coniferyl alcohol, trans-p-coumaryl alcohol, trans-sinapyl alcohol and other precursors. As these may be present in varying proportions in different plant species and as the polymerization is assumed to occur at random, the polymer that is supposed to be formed cannot by definition be described by an exact formula. The lack of reproducibility in experimental lignin chemistry is obviously taken as support for the hypothesis, which is not backed by any experimentally obtained data. It is thus no wonder that the chemistry of lignin arouses only limited interest among scientists and technologists. Surprisingly, the primary assumption of fundamental importance - that lignin is one single polymer - has not been questioned although it has long been known that spruce wood contains a small proportion of a lignin fraction, “Brauns’s native lignin”. This differs in its properties from “milled wood lignin”, which is probably the most commonly used lignin preparation. There are thus at least two different lignins in spruce wood. Or are there more than two - Is lignin a group of compounds, like the carbohydrates? To decide whether lignin is a single polymer or a group of compounds it would be necessary to include in the study all lignins present in a particular plant species. However, as lignin is covalently bonded to carbohydrates it cannot be extracted from the plant unchanged. For example, milled wood lignin represents only about 30 percent of the total lignin in spruce wood. Studies of this preparation tell us nothing about the 70 percent remaining in the wood; and the possibility that milled wood lignin is a mixture of different lignins (which may in some unknown way have been affected by the milling process) does not make the problem any easier. To be able to include in the study all lignin present in a particular plant species it is thus necessary to transform the lignin quantitatively into derivatives, which can then be extracted from the plant. Such derivatives can be obtained by heating wood in an acid bisulfite solution, in a dioxane-water mixture, in a solution of sodium sulfide and sodium hydroxide, or in a thioglycolic acid solution. However, we also need to understand both the stoichiometry and the kinetics of the reactions taking place more or less simultaneously in the formation of these lignin derivatives. A careful fractionation of the lignin derivatives followed by a comparative analysis of the fractions may provide an answer to the fundamental question of how many different lignins a plant species may contain and may also ultimately describe the structures of these lignins. The structure and reactions of a lignin have been adequately described if the composition of a lignin derivative calculated by simultaneously applying the stoichiometry and kinetics of the reactions to this structure is identical with that of the corresponding experimentally obtained derivative. Such studies were carried out at The Finnish Pulp and Paper Research Institute from 1956 to 1995. The studies revealed that Norway spruce wood lignin comprises about 85 percent of a single lignin polymer, while the remaining 15 percent is a mixture of low molecular mass lignins. Careful separation and analysis of the sulfonates of these lignins - obtained by heating spruce wood in an acid bisulfite solution - as well as the lignin derivatives obtained by heating spruce wood in a buffered dioxane-water mixture conclusively revealed that the polymeric lignin is composed of identical repeating units, each one comprising 18 phenylpropane units. The polymeric lignin in spruce wood thus has a regular structure. Figure 1 shows the constitutional formula of the repeating unit, i.e. a two-dimensional formula revealing which atoms are connected to which. Fig. 1. The constitutional formula of the repeating unit. Figure 2 shows the (three-dimensional) structure of a polymer fragment composed of four repeating units, viewed at an angle to the polymer axis. The four xylan chains (yellow) linked to each repeating unit are visible. Fig. 2. The three-dimensional structure of a polymeric spruce wood lignin fragment comprising four repeating units linked to four xylan chains, viewed at an angle to the polymer axis. The lignin theory developed and the experimentally obtained data on which it is based are described in the book The nature and reactions of lignin – a new paradigm by Kaj G. Forss and Kaj-Erik Fremer. The authors have published the book in the sincere hope that their results may, by stimulating new questions, help to revitalize research in wood chemistry and particularly in the chemistry of lignins, i.e. 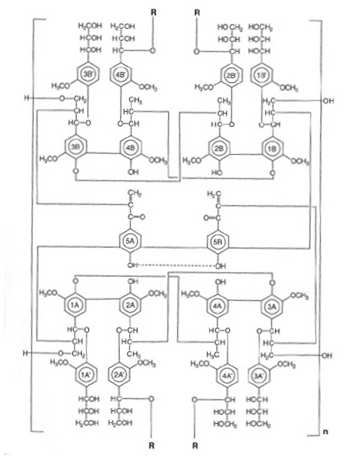 the multitude of high and low molecular mass wood constituents composed of phenylpropane units.